I'm Not Skinny: Ipsy, I'm in love with you Ipsy. Ipsy, I'm in love with you Ipsy. I feel like I hit the motherlode (a Sims 3 reference for any of you Simmers). 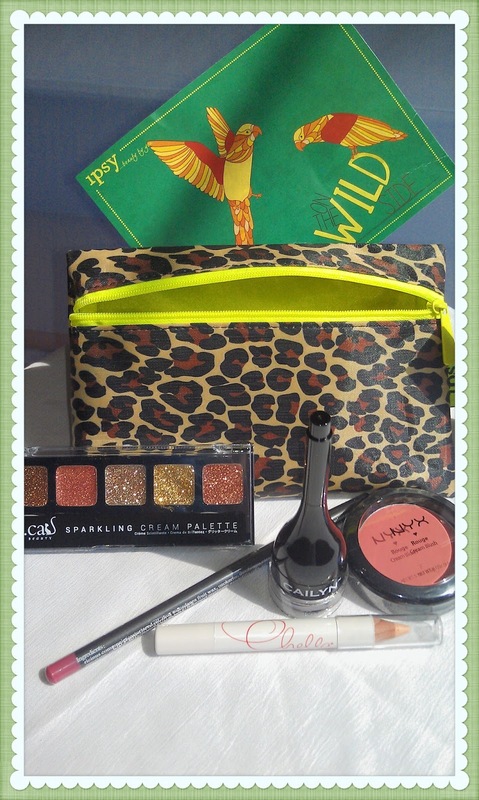 However, seriously this is the most amazing beauty box - bag I've gotten so far! It's like they continue to get more amazing. I'm blown away. All 5 of the products from my June Ipsy Glam Bag are full size, and thanks to ipsyMatch they are epic and perfect for me. The June 2013 Ipsy Glam Bag aims to encourage our wild side. Get a little playful, you foxy minx you. Even the bag (which is leopard print with a neon zipper and inside lining) says HAVE FUN IT'S SUMMER! Alright, enough of my babble right. You're just thinking WHAT DID YOU GET, WHAT DID YOU GET!? Which is what I was thinking when my sparkly pink bubble wrapped mail showed up. This product retails for $6.00. The color is great, really good pigment , a little bit goes a long way and it's pretty simple to blend. If you're looking for a long wearing, long lasting blush...this is it. Intended to lift and brighten the eye, dark circles and blemishes. I haven't tried this yet, but as a life long insomniac I can say that my now 29 year old eyes are RAVAGED with those evil dark circles and I'm in constant search of a product that will help me look and feel human again. Without actually using concealer because clearly my 'girly' transition isn't complete. Oh, it retails at $18.00 a pencil. Really you had me at the cat logo, because I'm a crazy cat lady and was even before it was cool. ☺ I took one look at these and was in love, then I tried a little bit of the gold and birds sang to me. I have a roaring 20's party to attend on Tuesday, and now I have my make up for that. Smooth, neat application with a non greasy finish. YES PLEASE! Retails at a very affordable $4.49. This might be a good time to mention if you sign up for ipsy's glam bag you also get access to coupon codes for the products included in each bag. You should probably sign up. A moisturizing lip pencil that doubles as a highly pigmented color. I'm a fan of the high pigmented lip look, and have been playing around with that much more so I'm sure I'll have fun with this product. This particular color is a matte, which I'm finding I really do like. I tend to like things glossy but something about a matte lip looks so complex and sophisticated. This product retails at $12.00. WOW! Just WOW! This might replace every other eyeliner I have. I might invest in several of the colors and actually toss everything else. I don't know if it's the brush or the gel formula, I'm sure it's actually a combination of the two but this made eyeliner easy. I'm going to have some purple smoky eye pictures coming up in the future. This product retails at $21.00 and I'd pay that for it. 1. I pay a mere $10.00 a month for IPSY and this bag was well worth it. It's my second bag, and I'm more in love this time than I was with the last one, and the last bag had nail polish. 2. These are great products. I'm in love with/planning to invest in at least 3 out of the 5 products in this bag. 3. Why haven't you signed up yet!? Please remember if you're clicking links to join from here that I did use my referral code, because I do like free things and earning points. If enough people sign up, I could potentially get a month or so for free. However, I'm paying for this bag, no one is giving me free things to review these products or to talk about these bags. Wow that is super awesome to pay just $10 dollars for all of those great beauty products! It's totally fun getting surprises in the mail. Lucky you, you are going to have fun playing with those colors. Makeup heaven!!! I really need to try their subscription program. I'm sure you'll get in soon. I think I waited about 2 weeks and got approved. I got a bag last month and should have blogged about it, but I was just too excited and had to use everything right away. I clearly lack any patience. What a great variety of products for a terrific price! I love subscription services they are my weakness. Would be nice if they are free though. hehehe Nice sparkly shades for the lips. It's nice to always find deals like this. Nice goodies and great beauty products. Haven't heard of this until now. it is pretty amazing for just $10 monthly subscription you'll get all of this. more than what you paid for. good job. I am not a big fan of makeup so i'll passed this one for now.